Whenever you are closing a Metro application In Windows 8, it’s moreover get paused rather than completely closing down. It just resumes the application and allows you easily switch between without starting it from a scratch. However, deleting application history in Windows 8 doesn’t seem to be necessary, but as its available for the sake of any purpose. You should not ignore it, you should perform this action. Lets check out how would it be possible to delete application history in Windows 8? 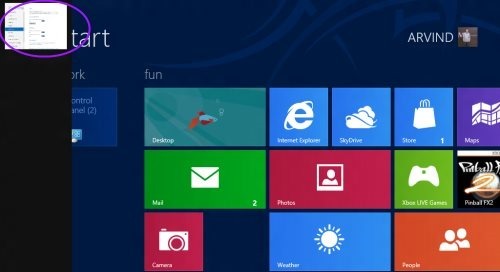 Before that, also check out our post on how to disable application switching in Windows 8. First starting with charms bar so just press Windows Key+I to launch the sidebar as shown in picture below. Click on “More PC Settings” option to proceed further. On clicking on “More PC settings” you will see the new Windows 8 “Metro Control Panel”. Now, head over to the “General” section. 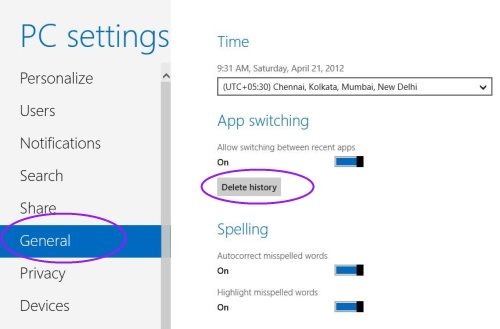 On the right side, you will see an option to “Delete History” below the app switching option. Just move the cursor and click on “Delete History” . 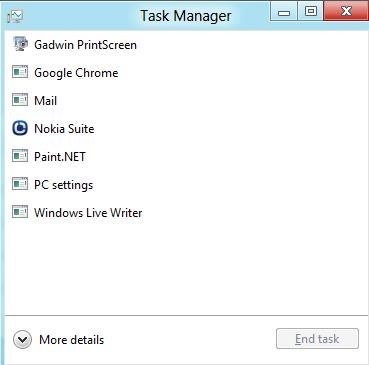 Now, go to task manager and you will notice that all the third-party application are also closed. In addition, it also completely removes the application from the switching list. You are done, now perform it on your Windows 8 PC. It deletes almost all the application history in Windows 8.